If you are wondering, “How Much Can I Put In My Roth IRA?”, you have come to the right place. We will discuss how much you can put in your Roth IRA and various situations that may arise. 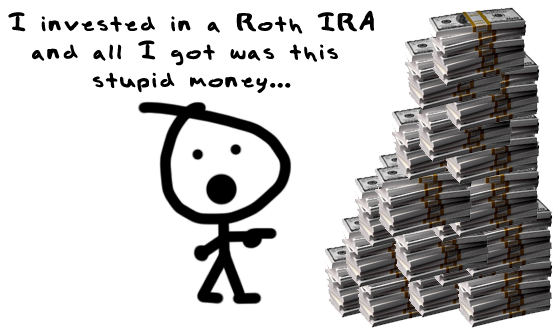 If you are unfamiliar with Roth IRAs, read more on the page entitled What Is A Roth IRA. For most of you, the answer will be the same. You can put $5,000 into your Roth IRA. But wait! This was the number for 2009 and the government appears to be very flexible with us during these trying economic times. Apparently, they are going to adjust this number for inflation. Well, currently the numbers have not changed. We are still limited to the $5,000 dollar amount. However, there is one exception, the IRA “catch-up”. The one exception to the $5,000 limit is the people who are age 50 and over. This is called the IRA “catch-up” allowance and allows people to contribute an extra $1,000 each of these years. Apparently, the government (in its infinite wisdom? ), realized that we are not a nation of people who is planning well for the future. We are the “Now, Now, Now” generation of people. Thus, when people are 28, instead of putting $5,000 in a Roth IRA, they elect to buy one of the best LCD TVs, get a great home theater, and take a trip to the Bahamas. Buzzer! Sorry, you cannot do that. You can have several IRA’s but the total combined contribution cannot be great than $5,000. However, you can have both IRAs and 401ks at the same time. Thus, max out that 401k as well if you are behind on your retirement contributions. Roth IRA Best Rates: This article discusses the best place to open a Roth IRA, which one is best for you, and how you can get the Roth IRA Best Rates. How To Open a Roth IRA: This article discusses the procedures in opening a Roth IRA and which type of account fits your situation best. What is a Roth IRA: Yours truly wrote this explaining, in lay man’s terms, just what is a Roth IRA.